Disclosure: This post is sponsored by Febreze™ Air Purifiers and the BlogPaws Professional Pet Blogger Network. I am being compensated for helping Febreze Air Purifiers but Budget Earth only shares information we feel is relevant to our readers. Febreze Air Purifiers is not responsible for the content of this article. As some of you know, earlier this month we introduced a pretty nifty HEPA-Type air purifier into our home – the Febreze™ Air Purifier. With two large dogs in our home (even though one is a large puppy) we have a variety of unpleasant odors in our home, usually from puppy gas or us dealing with finding Ivi’s mysterious food allergy. Since the girls spend most of their time in our home office, we loved the idea of having an air purifier with scent in our home office. After nearly a month of using it in our office, we are excited to report to you guys exactly how the Febreze Air Purifier works as a household odor reduction unit and household dust reducer. We think you are going to be pretty impressed with the results! Febreze Air Purifier: What is It? Never heard of the Febreze air purifier? This Energy Star qualified HEPA-Type air purifier removes up to 99% of air pollutants in the room where it is located – making your air healthier while also smelling great. What makes the purifier so amazing however is its double specialization in both household odor reduction and being a household dust reducer. No one wants lots of dust (or pet fur) in their air, so Febreze decided to make an air purifier with 3 air cleaning levels that also freshens your room with an amazing scent four times an hour. Since they know everyone has different needs, they give you ability to customize this unit with 2 amazing air purifier scents, a dial for fragrance strength, and how fast you want the unit to work (for noise level and if you are putting the unit in a very dusty room). In the end, you are left with a fresh smelling room with amazing air. Who knew that knew that using an air purifier with scent could be so easy! To learn more, check out the awesome video from Julie Edelman below! After running this unit in our office for three weeks, I have to say we are fairly impressed with the Febreze Air Purifier. Its odor control unfortunately was put to the test with both of our girls having a stomach bug and then discovering Ivi may have a food allergy. It was truly having to deal with some horrible smells, and lived up to being an air purifier for odor. What really impressed me was just how well the Febreeze air filters work, especially since it didn’t take long until we couldn’t smell any nastiness in the air from accidents, only the smell of the air purifier scent cartridge we were using (we ended up trying them both). It was amazing just sitting back and relaxing after dealing with a sick puppy, and enjoying a fresh-smelling office. I will say though that the scent is fairly powerful – we actually have it in a room that is a bit too large for the unit and it is giving off a very nice scent throughout our office with the scent dial on high. Honestly, I am thinking of getting one of the Febreze tower units to see if it does just as well in other, more open areas in our home. 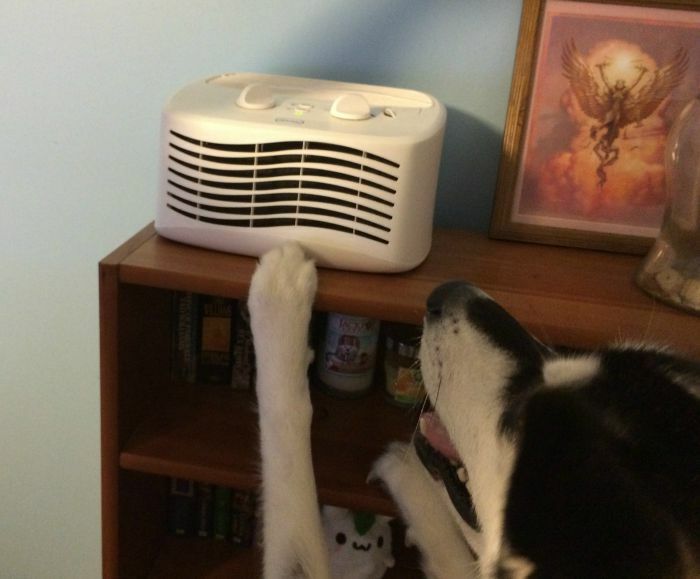 Really, I think this air purifier with scent is an amazing addition to any pet friendly household. Based on our own experience, I am happy to give the Febreze Air Purifier an A rating! Want to purchase the Febreze Air Purifier for your own home? You can buy this awesome air purifier for odor in one of three sizes – Tabletop (what we reviewed), Mini Tower, or Tower. Currently, you can purchase the Febreze Tabletop Air Purifier at your local Wal-Mart for $53.89 and the Febreze Tower Air Purifier for only $79.99 on Amazon.com. Also, don’t forget to pick up extra scent cartridges (available in linen & sky and spring & renewal) and extra Febreze air filters with your new Febreze air purifier! So, what do you think? Do you think the Febreze air purifier would be a great addition to your home? I could use this i need something to clear the doggie smells. Thanks for sharing, we have 2 dogs and 2 kids. Plenty of yucky smells. I like how small and compact it is. Easily fits anywhere in the room. The Febreze™ Air Purifier sounds amazing, I would love to have one of these. Thank you for sharing this review. As soon as I saw the title on this post I knew I had to read it. We also have two dogs though not as big as your (pugs) can have the house smelling and sometimes looking like a doggy day care. The puppy has her good days and bad days where she will tinkle in the house. Not good at all. I had no idea Fabreeze who’s spray I love had a Hepa Air Purifier. 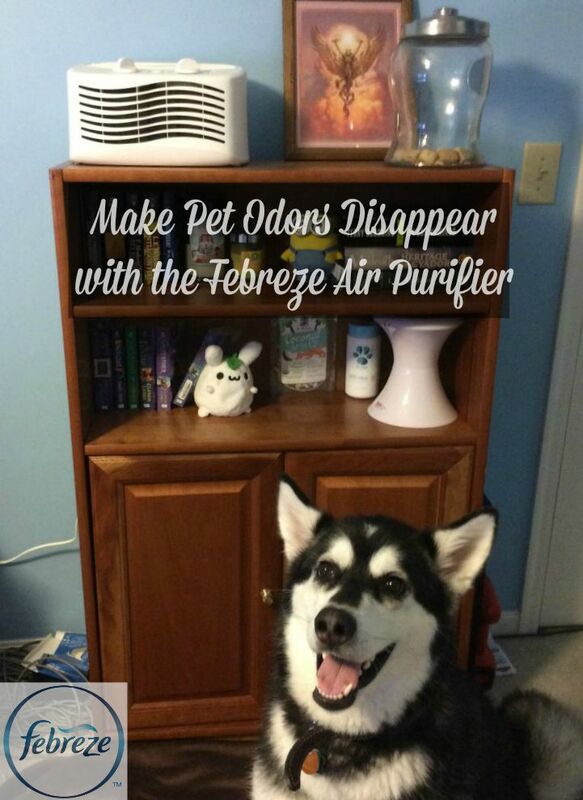 A purifier that can actually get rid of dog odor and make the home less dusty. This is what we need, this is what my cousin in NY needs. I stood with her in the winter and boy did my allergies act up and no matter how many candles we used and air freshener people who would come to visit said it did smell like dogs. She has a maltese and for a short time a puggle. Unlike my dogs that go on several walk a day to potty those used the wee wee pad. She uses the arm and hammer one and we change it as soon as it was soil but the odor linger. Will let her know about this product. Ugh – I am not a fan of most potty pads. No matter what you do you just can’t GET The smell out! I have used some from PetSafe that were good but they still have to be picked up immediately and you have to be careful with smells. Ivi has her good and bad days with potty training but I have no clue what I would do without this thing in my office. It has really helped deal with allergens (we have plants blooming outside) and the dog hair/dander. I like the concept of an air purifier. But Febreze products give me a headache from the chemicals they use. I use a diffuser with essential oils. With both children and pets potty training, my home could really sue a wall size filter. Too bad they do not make a wall size deodorizer for home use, I would be on that. Love the interactive photos with your beautiful dogs! They seem to get right into the review 🙂 I have a cat, and he has his moments as far as smells go as well… I am more tolerant than my husband of the litter box odors but on hot days such as we’ve been having here in the Northeast recently I have to be really vigilant about cleaning it out. This might be a great option in our entryway and in our bathroom, I love Febreze scents so I will look for it in the store. I could definitely use one of those. We have 5 kids that bring in all kinds of allergens & dust. not only doggie orders but i have amazon parrot orders. This looks great. Especially for the room with the litter box. Sounds like Febreze has another great product. What a nifty idea! We have two dogs and I need a new purifier for the front room where they stay a lot of the day. Thanks for the head’s up…I’m checking this out! I had no idea that Febreeze made an air purifier. I am going to check my Walmart for the Tabletop one. I have a dog and a husband that works outside part-time (painting, pressure washing, and mowing lawns). This would be good to keep in the living room. it’s a nice small unit that can be placed anywhere in the house. I really like that it purifies the air. It doesn’t just cover up odors; it works to make your air healthier. I didn’t even know about this product, thanks for the article. We’ve got quite a few furbabies, this is an absolute essential for our home! I could certainly use this in our front hallway. One of my daughters cats has decided to pee in on the carpet. We think she is marking because of stray cats outside. Not matter what we use she still does it. We have tried so many products it is crazy. I love the idea of an air purifier. I have never seen these before and I will have to check it out. Thank you for sharing your review. I would welcome ideas on how to stop this little girl from doing what she does! I would love a Febreze air purifier. We have a cat and could use one where she spends a lot of her time, definitely! Wow, this looks like a great product! It would be the perfect solution to clear any stink from my house and having a couple dogs, there are plenty of odors at times! My husband would love this too. We’re considering getting a cat again after our’s passed away. One of my biggest complaints about having a pet is the odor. I can get over pretty much anything except pet smells. If this actually works I will be one happy camper! I use a lot of Febreeze products but I had no clue until your review they made the air purifiers. I will dfinitely be looking into both units. I spend so much money on sprays & candles that it would be better to have one of these. Thank you so much for your review. I would love one of these but haven’t seen them in our area yet. I have two dogs so I know about pet odors. I truly enjoyed reading this very informative article. We do not have any pets in our household, but I will be sharing this article with a family friend who does. Thank you. I know about Febreze products but was not familiar with their air purifier. This would be really nice to have, thanks for sharing! With three cats (and two litter boxes) and four dogs (one of who is 14 and having trouble holding her bladder and using a lot of piddle pads in the house), I could really use something like this. I agree this information is great. I do use my Febreze Air Purifier to get rid of smelly odors. I could definitely use this to get rid of the smell of wet dog. I wonder if this will help in the changing area of multiples? Things can get stinky and linger. I think that the Febreeze purifier is a great idea. I could use one or more and my son with hi 2 cats could use one too! This gadget would make a smart addition. Several of my family members have asthma, and it would also help out blocking odors from the two pets we have! I would love to try this we have indoor pets and are always fighting pet odors. Animals smell bad. I have used Febreze for cooking odors and it does work. I can’t speak for animal odors. I do know when you live with something, you do become nose blind. Animals, smoke, whatever. 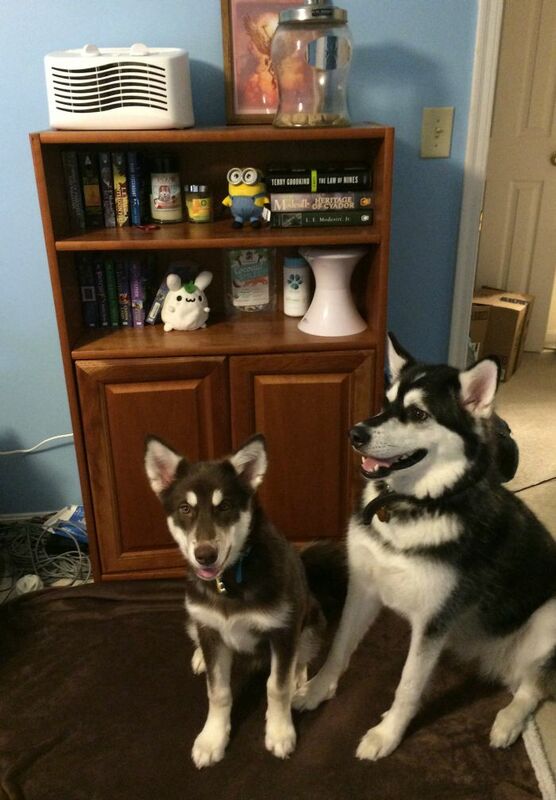 Your pups are gorgeous! I’m going to check out Febreeze air purifier this weekend! Febreze has always been my go to product for all things stinky!! Love it!! I think this will be great for my home. I can’t stand smelly pet odors. I didn’t even know febreze had an air purifier! I am going to have to check it out with 2 cats and a dog I could certainly use one! it’s really a great addition in our home! This is great for litter box odors. Even though I keep it clean, there is sometimes a smell. I don’t have pets, but I sure could use this for other household odors! I didn’t know febreeze had a product like this! It would be great to freshen up my home. I have two dogs, and odors sometimes can be an issue. Will have to try. I was not aware of these! I have a cat and a dog and although I work hard at not having pet odors, I do worry if others smell what I don’t. I love Febreze and their products! I know that we aren’t supposed to be critical on these blogs (ever of any product), but Farbreeze just adds a layer of cheap scent over what ever odor is there. It’s disgusting really. I learned some stuff I didn’t know. I definitely need this with two dogs! I love this purifier, I have got to get one of these. I just need for it to go on sale. Thank you for sharing this review. These may work on ambient, light odors, but I find that you really have to eliminate odors at the source. I have four dogs, so these tips will definitely come in handy. This sounds great! I would try it! These sound amazing and I really want one. My husband is a smoker and I would love to get rid of that smell. I need one of these so my house doesn’t smell like ‘dog’. Sounds like this would work well also for litter box odors. I scoop frequently also but with two large cats it is hard to keep the smell from permeating. Huge fan of the febreeze spray, but this air cleaner seems more convenient to use.